The runaway success of director James Cameron’s ALIENS sequel in 1986 turned the property into a major franchise for Twentieth Century Fox. Executives wanted to strike with a third ALIEN film while the iron was hot, but coming up with the right story proved tricky. Adding to the threequel’s film’s development woes, a revolving door of writers and directors experienced immense frustration with a studio that was too meddlesome with its prized jewel of a franchise. In a long search for an inexperienced, yet talented, director that they could control and micromanage, Fox settled on David Fincher—a rising star in the commercial and music video realm with a professed love for the ALIEN franchise and its founding director, Ridley Scott. Fincher jumped at the offer to direct his first feature film, but in retrospect it was a naïve move that almost destroyed his career before it even began. His supreme confidence and bold vision clashed with the conservative executives, causing a long, miserable experience for the young director. He eventually disowned ALIEN 3, abandoning it to flail and die at the box office. However, as Fincher has grown to become recognized as one of America’s major contemporary auteurs, his debut has undergone something of a reappraisal in the film community, with fans choosing to see the good in it instead of the bad. More than twenty years after its release, ALIEN 3’s legacy to the medium is that it makes a hard case against the kind of filmmaking-by-committee that meddlesome studio executives still impose on gifted visionaries to this day. ALIEN 3 picks up where ALIENS left off, with Lt. Ripley (Sigourney Weaver), Hicks (Michael Biehn), and Newt (Carrie Henn) resting in cryosleep as their ship, The Sulaco, drifts peacefully through space. However, in their hibernating state, they are unaware of the fact that an alien facehugger has stowed away onboard their craft. Its attempts to penetrate and impregnate our heroes leads to a fire on deck and the cryosleep chambers are jettisoned away in an escape pod that crash lands on nearby on Fiorina 161, a sulfurous industrial prison planet colloquially known as Fury. Tragically, Hicks and Newt don’t survive the crash, but Ripley does when she’s discovered by a group of inmates and nursed back to health. Once restored, Ripley finds herself thrust into an all-male, religious extremist culture that hasn’t seen a woman in decades. Ripley quickly toughens up to counter the sexual aggression of the inmates, but her problems multiply when its discovered that one of the alien xenomorphs has followed her to Fury 161 and is picking off the inmates one by one. A distress signal is dispatched to a rescue ship, but Ripley and the inmates still have to contend with the xenomorph before help arrives, a task made all the more difficult by the lack of conventional weapons anywhere in the prison facility, as well as the discovery that Ripley is hosting the embryo of a new egg-laying Queen alien inside of her. In her third performance as Ripley, Weaver yet again transforms the character via a radical evolution into a tough, resilient survivor. Her arc throughout the three films is compelling, and for all the controversies over the film’s storyline, Weaver deserves a lot of credit for never phoning it in when she very easily could have. Hers is the only familiar face in this hellish new world, save for the mutilated visage of Lance Henriksen’s android Bishop (and his flesh-and-blood counterpart that appears towards the end of the film). Among the fresh blood, so to speak, Charles S. Dutton, Charles Dance and Pete Postlethwaite stand out as the most compelling inmates on Fury 161. Dutton plays Dillon, a tough, righteous voice of spiritual authority that the other inmates can rally behind. Dance plays Clemens, the sensitive, intellectual medical officer who helps Ripley acclimate to this harsh world and harbors a dark secret of his own. The late, great character actor Postlethwaite plays David, an observant prisoner with a high degree of intelligence. 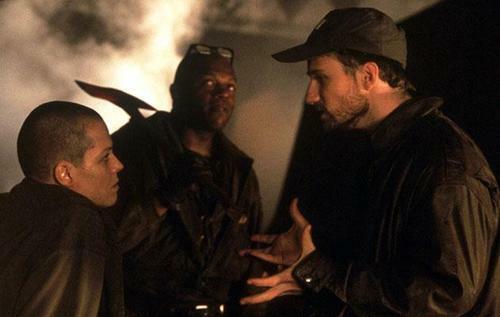 Fincher’s collaborations with director of photography Jeff Cronenweth in the music video realm led to Fincher hiring his father, the legendary Jordan Cronenweth, as ALIEN 3’s cinematographer. Best known for his work on Ridley Scott’s seminal 1982 masterpiece, BLADE RUNNER (itself a huge influence on Fincher’s aesthetic), Cronenweth was being slowly consumed by Parkinsons Disease during filming. The earliest of ALIEN 3’s several considerable production woes, Cronenweth’s condition deteriorated so quickly that cinematographer Alex Thomson had to step in and replace him only two weeks into the shoot. Despite this setback, ALIEN 3 is a visual stunner that firmly established Fincher’s uncompromising style in the feature realm. Fincher’s stark, grungy aesthetic translates well into the theatrical anamorphic aspect ratio format, with the smoky, industrial production design by Norman Reynolds giving Fincher plentiful opportunities to incorporate artful silhouettes and his signature cold, desaturated color palette (only Fincher can make a palette that deals heavily in oranges and browns feel “cold”). Fincher’s emphasis on architecture and world-building manifests in a subtle, surprising way—he chooses to shoot a great deal of the film in low angle shots that look up at the characters and expose the ceiling. This creates an air of helplessness that pervades the film, like we’re way over our heads and drowning in despair. While this hopeless mood ultimately might have contributed to the film’s failure at the box office, it’s an inspired way for Fincher to communicate a real, tangible world that draws us into it—most sets are built without a ceiling so a lighting grid can be easily installed overhead, but by showing the audience the existence of a ceiling, it subconsciously tells us we are in a place that exists in real life… and that the events of the film could very well happen to us. Fincher and Thomson’s camerawork in ALIEN 3 is also worth noting. Fincher has always had a firm, visionary command of camera movement, and the considerable resources of studio backing allows him to indulge in sweeping, virtuoso moves that bring a fresh, terrifying energy to the film. A particular highlight is a tunnel sequence towards the end of the film, where the xenomorph chases the inmates through a huge, twisting labyrinth. Fincher uses a steadicam that assumes the POV of the xenomorph as it rages through the tunnels, twisting and spinning at seemingly impossible angles to communicate the alien’s terrifying agility and speed. The industrial, foreboding nature of Fincher’s visuals are echoed in composer Elliot Goldenthal’s atmospheric score. Instead of using traditional symphonic arrangements, Goldenthal blurs the line between music and sound effects by incorporating non-instruments and electronic machinations into an atonal blend of sounds. In many ways, this approach proves to be even scarier than a conventional orchestral sound could conjure up. To reflect the medieval, religious nature of Fury 161’s inhabitants, Goldenthal also adapts haunting choral requiems that weave themselves into his tapestry of ominous sounds and tones. ALIEN 3’s infamous production disasters are well documented, hopefully as a means to ensure that the film industry as a collective learns from the production’s mistakes. These woes began during the earliest stages of pre-production which saw the hiring and resigning of director Renny Harlin before Vincent Ward came onboard for a short period to realize his vision of a wooden cathedral planet populated by apocalyptic monks. While a semblance of this conceit remains in the finished film, the script was changed radically several times before cameras started rolling, and even then the filmmakers didn’t have a finished version to work from. The ramifications of this were numerous, from actors being frustrated with constantly-changing character arcs, plot inconsistencies, and even $7 million being wasted on sets that were built and never used. 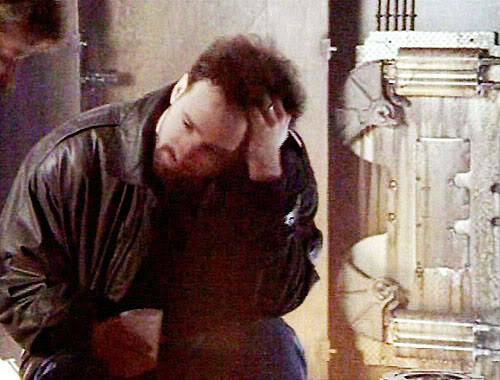 The process was particularly hard on Fincher, who was constantly fighting a losing battle against incessant studio meddling that overruled his decisions and undermined his authority. Fed up with the lack of respect his vision was being given, the young director barely hung on long enough to wrap production, and walked off entirely when it came time for editing. The fact that he ever decided to make another feature film again after that ordeal is something of a miracle. Despite constant challenges to his control of the film, Fincher’s hand is readily apparent in every frame of ALIEN 3. A science fiction film such as this is heavily reliant on special effects, a niche that Fincher’s background at ILM makes him well suited for. Computer-generated imagery was still in its infancy in 1992, so Fincher and company had to pull off ALIEN 3’s steam-punk vision of hell and the devil through a considered mix of miniatures, puppets, animatics and matte paintings. Some of the earliest CGI in film history is also seen here in the film, in the scene where the skull of the hot-lead-covered xenomorph cracks under the sudden onset of cold water before exploding. Fincher’s fascination with technology plays well into the ALIEN universe, where the complete absence of technology—and for that matter, weapons—is used as a compelling plot device to generate suspense and amplify the hopelessness of the characters’ scenario. In order to vanquish the monster, they ultimately have to resort to the oldest form of technology known to mankind: fire. 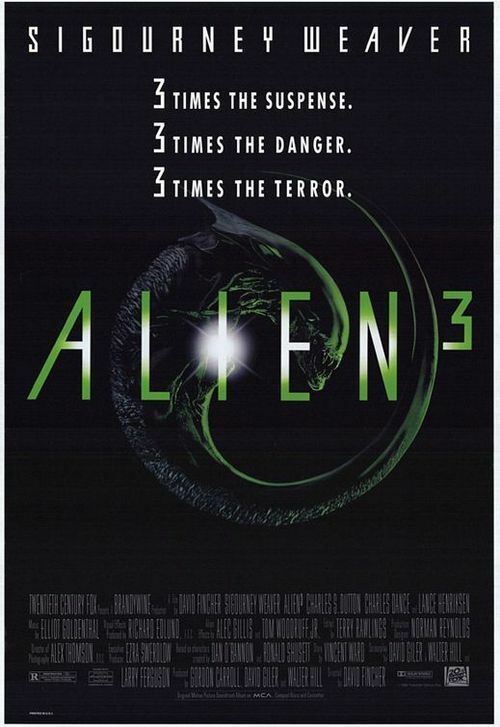 ALIEN 3 fared decently at the box office, mostly due to franchise recognition and the considerable fan base built up by the film’s two predecessors, but was mercilessly savaged by critics (as was to be expected). Long considered the worst entry in the series until Jeanne-Pierre Jeunet gave Fincher a run for his money with 1997’s ALIEN: EVOLUTION, ALIEN 3 has become something of a cult classic as Fincher’s profile has risen. Fans forgave the film of its transgressions because they knew Fincher’s vision had been hijacked and tampered with. They knew that somewhere out there, in the countless reels of film that were shot, Fincher’s original vision was waiting to be given shape. In 2003, Fox attempted to make amends by creating a new edit of the film, dubbed the Assembly Cut, for release in their Alien Quadrilogy DVD box set. Fincher refused to participate in the re-edit, understandably, so Fox had to go off his notes in restoring the auteur’s original vision. The 2003 Assembly Cut differs markedly from the 1992 original, restoring entire character arcs and adding a good 50 minutes worth of footage back into the story. There’s several key changes in this new cut, like Ripley being discovered on the beach instead of her escape pod, the xenomorph bursting out of an ox (and not a dog), and the removal of the newborn alien queen bursting out of Ripley’s chest as she falls to her death. The end result is a much better version of the film, giving us greater insight to the characters and their actions. While it doesn’t quite make up for the studio’s stunning lack of respect for Fincher during the making of the film, it ultimately proved that their concerns that the untested young director didn’t know what he was doing were completely unfounded, and were the film’s ultimate undoing. The experience of making ALIEN 3 would be enough for any director to quit filmmaking forever, but thankfully this wasn’t the end for Fincher. He would go back to the music video and commercial sector to lick his wounds for a while, but his true feature breakout was just on the horizon. ALIEN 3 is currently available on high definition Blu ray via Twentieth Century Fox.